The Watercolour Log: Beware the Hype! The JZ and Alvaro sets of grey are a curious additions as neither artist actually uses those tubes of paint. Pure marketing. But I'd give a pass to Jane as she has long mixed her own "Jane's Grey" and adding a little of one paint or the other will modify it--and she does use both single pigment paints on her palette. To clarify, I'm not suggesting either of you is criticizing Jane. Product marketing has always been intense in claiming such and such artist uses this item, so you should too. Just look back through some vintage art magazines such as American Artist. I do think the self-marketing product reviews and promotions by artist themselves has worsened the whole thing. I always keep in mind what a teacher once told me. I’m not critising Jane (Jane who?). Thanks all for comments. I do wonder if the VAT represents a good portion of the price difference in paint between the US and the UK. From your other post I was shocked at the amount you'd have to pay for a 14ml tube of W&N; much less here. Prices here have escalated over the last two years. 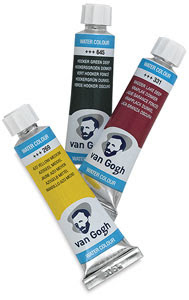 Winsor & Newton were often available at good prices, below Daniel Smith but not at present. Daler Rowney have increased by a considerable amount. The American makes of Graham, Daniel Smith and Da Vinci have always been more expensive than in America. Mind some other countries are even worse regarding prices. As far as this 'grey' thing goes I'm staggered we need umpteen ready made greys. It's easy enough to mix them with a little practice. This is marketing gone mad. Excellent article Peter! Its true DS is very commercial. I can t blame them. I did visit the Old Holland factory not so long ago! They told me the brand did have the highest pigmentation of all brands, and the small tube would go a long way. With this in mind I bought me a few tubes 5 ml. a big disappointment for the ultramarine, cobalt blue, Raw Sienna and Old Holland ocher. very weak colours. I asked the factory to investigate and still waiting. my point is, every factory will say they have the best. I bought also 3 colours from DS. And would not buy them again. one tube was even 22 euros! I stay with my Rembrandt. and Cotman now and then! A thoughtful and well written article. Thank you. As one of the "ambassador" artists let me point one thing out. I've painted professionally as an architectural illustrator and fine artist for over 20 years. I've tried a lot of paint. I use a lot of paint. In my workshops and those of most of my friends that teach there is always a disclaimer before or after the materials list. Mine reads as follows. "In most cases the colors you already have will work if you have good quality paint. I don't expect you to buy every paint on my palette- if there is a color you have in question please email me. Any for other watercolor materials you generally use. In most cases the materials you already own will work. I would, however, suggest that you have at least one large wash brush one mottler and a pointed detail brush at size 10 or 14." I make a point at the beginning of each workshop that it's generally not the materials (or even specific colors) that will help them it is how they are handled. In my last workshop I took a piece of lichen from a tree and used that as a stamp to create a tree shape in my demonstration. I also use Escoda brushes and for a very specific reason. I have found that their synthetic brushes are some of the finest man made fibers I have tried. The reason I have touched on this subject is that I no longer buy animal hair brushes. I'm not trying to wax lyrical about endangered species and animal cruelty I simply find that in my hand a Kolinsky will lose it's point very quickly. There is also a notable spring and extremely sharp point that the Perlas have that I have not experienced in other manufacturers. Of course these brushes are in high demand in my workshops but I do not offer them as of now. When I teach a workshop I have original paintings for sale and I mention that at the beginning of the class and then I am done with any marketing. I don't sell Daniel Smith Paints- but they are kind enough to let me have enough to share with my students. I will typically go through 2-3 tubes at least letting students try them out. I enjoy them and although they are not the only manufacturer I use they do have a couple of things going for them that I believe is somewhat unique. Once you have filled your palette and left it open over night the colors set meaning they will not move or spread in my palette as I travel. I also do not have to "pre wet" my palette as the colors remain usable and do not dry out. Relatively speaking they are a small company amongst giants. They are no tiny mom and pop but they aren't speedball either. The same goes for the Escodas. They are a wonderful and generous family and I have visited their factory outside Barcelona. I have met the woman who specializes in making the exact brush I use and I know that when I pick that up it's more than likely gone through her hands as well. That is a special connection for me. A hero of mine the late Rowland Hilder said- when you paint imagine you are a millionaire. You cannot worry about what your materials cost and still "play for discovery" to better understand how your colors react with one another and practicing wet in wet along with other techniques best tested on paper you have not drawn on. If the painting is precious before it begins it's ruined. I painted with Cotman colors for many years and when I made the jump to artists grade the results were extremely noticeable. This may not be the case for you. I don't know. So, in conclusion, let me say we do not all have everyone of our students out buying hundreds of dollars / pounds / euros of paint nor do we all think that is a good idea. In the end the tools don't really matter though. It's what you can do with them. Thank you for taking the time to write such a thoughtful article and I do hope that this response is not taken as a rebuttal but rather an explanation of my ideas regarding your subject. Iain. Thanks all for comments. Iain I understand you're point of view and I wasn't getting at you or artists like you. I was quite specific and the examples quoted are true. A few years ago one artist who came to my local art group to do a demo arrived with an art shop in his boot of makes he was promoting. Of course students at workshops and demos are interested in what the artist uses. That's not the same thing as the ;points I was making. Peter, today I found this youtube video apparently from a recent demonstration JZ did in China. In part 2 he says he no longer uses neutral tint; interesting timing given Daniel Smith's introduction of JZ neutral greys! The best solution is to buy fewer (high quality) paints in tubes. All I basically need and use is Ultramarine, Purple Magenta, Phthalo Green and Lemon Yellow. I buy 15ml Schmincke tubes. 24ml Lukas is also OK.